Willacy County State Jail is a private facility located in Raymondville Texas. The facility is privately run by Corrections Corporation of America (CCA). 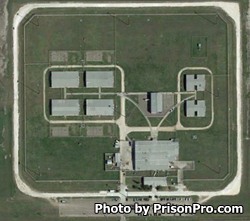 Willacy County State Jail is situated on 100 acres and first opened in 1995. Through the years Willacy County State Jail has been operated by several different private correctional companies. Currently Willacy County State Jail is a minimum to medium security jail and houses a maximum of 1,069 male offenders who can have a G1, G2, or Transient status. Willacy County State Jail is secured by a thirteen foot fence with razor wire barriers, and multiple electronic surveillance systems. The facility is comprised of eight general housing units; four of which are individual units with 54 beds in each, the other four units contain two 24 bed dormitories in each. Additionally, Willacy County Jail has a 30 bed special housing unit reserved for those facing disciplinary detention or reclassification/transfer. Inmates incarcerated at Willacy County Jail may participate in educational classes that include adult basic education, substance abuse education, life skills courses, and have the ability to earn a GED. Vocational training at Willacy Jail includes a plumbing and painting program. Additional programs at Willacy teach parenting training, provide support groups and teach religious studies. Willacy County State Jail conducts visitation on Saturdays and Sundays from 8am to 5pm. Visits are up to two hours in duration. Anyone who arrives after 3pm will not have a full two hour visit as visitation ends at 5pm regardless of the time you arrived to visit. Always call ahead to ensure your inmate is allowed visitation. Offenders who are undergoing the intake process, are in solitary confinement, are G5 status, in administrative segregation, or on a lockdown status are now allowed visits Inmates are allowed one visit each weekend. A maximum of two adult visitors are allowed, children under the age of 18 do not count as a visitor however the number of children allowed per visit will depend on the amount of space in the visitation room. Visitors should only bring their ID, car key, and a clear Ziploc bag containing up to $20 in quarters to purchase items from the vending machines.